I’m going to share with you something that my lovely Mum told me today, that you may find reassuring. All this week, I have lots of exams and one of the exams I had done today, I did awful on. And this isn’t be being like “OH MY GAWD I HAVE COMPLETLEY FAILED; I’VE PROBS GOT LIKE 80%!” I know that I haven’t done well at all. This was due to my lack of revision, but also due to my lack of enthusiasm for the subject. You see, I’m an all-rounder at most subjects and I get high grades in most of them. While this is a very good thing, it also has some disadvantages. I always feel like I’m expected to get high grades all the time, but that’s impossible. There are some things I just don’t understand. Nobody is good at everything. So, when I know that I’ve not done anywhere near as well as what I would normally do, I feel as though I’m going to be questioned as to why I got such a low mark. The subject was Geography and we’ve just never got on! Yes I know I want to travel a lot but I just dislike the subject. A lot. What my Mum told me was that, by “failing” and perhaps not doing as well as you normally would, you are learning that you’re not going to go through life passing everything with flying colours. You are going to come to a time where you’re not going to do as well as you’d wished. But the people who have always gone through school passing everything will find it extremely hard to deal with when it comes to a point in their life when they don’t do as well as they had hoped for. But by having experienced “failing” before, you’re going to find it much easier to deal with. Now don’t get me wrong, I’m not saying to just fail everything, don’t revise and you’ll be fine! I’m saying that, please don’t worry if you didn’t do as well as you’d hoped. If you really want it that badly, then you’re going to have to pick yourself up and work extra hard and try to motivate yourself to achieve what you want to achieve. In my case, I’m not actually taking Geography any further and so my result isn’t going to effect the rest of my school life! 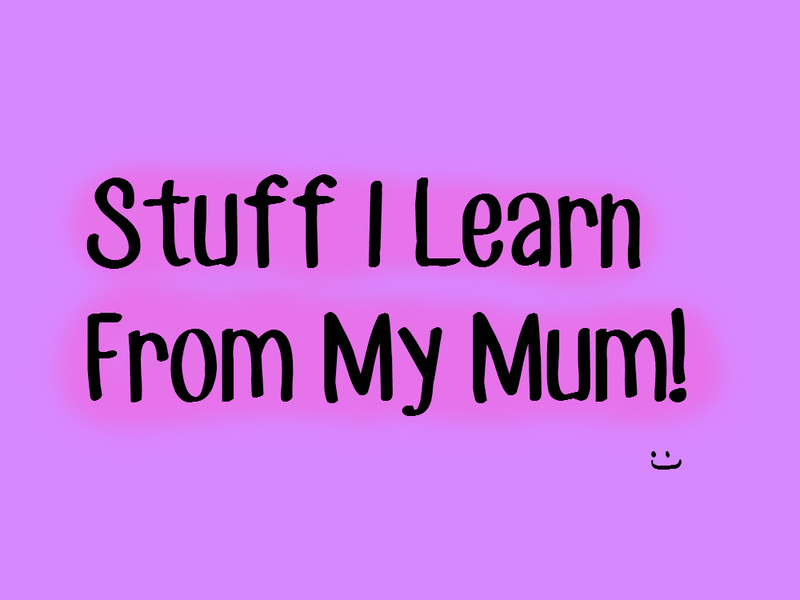 I think I’m going to do a few more of these “Stuff I Learn From my Mum” in the future as they’re quite nice! That advice is so true! 🙂 Unfortunately, my parents don’t really share the same attitude as your mum. I got 7 out of 30 in my year 9 physics exam, because I didn’t understand any of the stuff. I still got into triple science though – don’t know how that happened. But that fall knocked me back so badly that I couldn’t do anything and I felt awful. My friends, rightly, pointed out to me that it was just ONE mark. Mothers are just the best! 🙂 That’s very good advice she gave- thanks for sharing!